Our community has lost a beloved and dedicated health care advocate, and we at Champaign County Health Care Consumers have lost a dear and devoted friend, and a leader of our Medicare Task Force. Our beloved Eliza Catchings passed away on Monday, November 19, 2018. See the bottom of this message for information about her memorial service, which will be tomorrow. 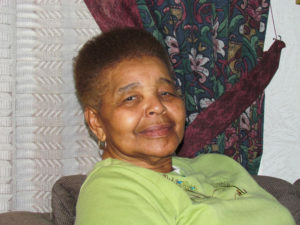 Eliza Catchings was a dedicated and proud member of CCHCC, and a steadfast activist with our Medicare Task Force. She was also quite a character, in the best way possible. We at CCHCC have loved Eliza forever, it seems. Eliza was at every gathering we had – whether our Annual Awards Dinner or the Holiday Party at our office. For our Holiday Party, Eliza would always bring some baked goods (banana bread, zucchini bread, etc.) – and they were always exceptionally delicious! Eliza knew she could bake, too. When you would try whatever she brought, and you would invariably compliment her on how good it was, she would say “Mmm hmm” and look at you like, “I know.” That is to say that Eliza had confidence and strength, and whatever she worked on, she did it right – with care and precision. Eliza was no-nonsense! This quality helped make Eliza an excellent activist as well. Eliza never needed to be front and center – she was not egotistical. She just really cared, and wanted to see the work get done. She was diligent and reliable, and she loved to be in the mix of the things we were working on. You could just count on Eliza – always. Eliza made national news in 2016, as a result of advocacy work she did with our former co-worker, Jen Tayabji. Eliza had signed up for a WellCare Medicare Advantage Plan, and found out too late that Christie Clinic was not in network and was not accepting this plan. The plan did not provide timely information, and most plan members, like Eliza, were not given enough advance notice about the changes to the WellCare network and how it would affect their access to care. And, under Medicare rules, the 900 affected plan members in our community were not allowed to change plans outside of Medicare Advantage Open Enrollment period – they would be stuck for a year with a plan that wouldn’t cover them at their doctor’s office! But then, as a result of Jen and Eliza’s advocacy and collaboration with other organizations in our state, the federal CMS granted a rare Special Enrollment Period (SEP) to all 900 of the affected members with those WellCare Advantage plans, allowing them to switch plans if they wanted to, in order to keep their doctors! Eliza’s meticulous documentation of her situation is what helped convince government officials about this problem and pave the way for this victory. We believe that this is the first case of CMS granting an SEP in the state of Illinois! Eliza was really funny. She didn’t clown around. She was quietly funny and wry – you had to pay attention to catch her humor. She was also quite lively and bold. And she showed us in so many ways how much she cared about our organization, and our staff, Board Members, and volunteers and activists. She was part of our family. Or she made us part of her family. We will miss her terribly. Please join me and CCHCC in remembering our friend Eliza Catchings. Eliza did good in this world, and she was fun, and she made us better and stronger. A celebration of life for Eliza Catchings will be held tomorrow – Wednesday, November 28, 2018 with visitation at 11 a.m. and the service at noon – Sheriff’s Temple AOH Church, 601 E. Vine Street, Champaign. Our hearts go out to all of Eliza’s family, friends, and colleagues. We join you in celebrating her life and our gratitude for knowing her and working with her, and becoming family with her. Our pledge to Eliza is that we will continue to work diligently for health care access and justice for all, and to improve the health of our community.